My hair is long enough to wear a ponytail. Maybe I'll be able to sit on it by the end of the school year. My hair is getting long too. This is what happens when you never get it cut. "Her elegant fingers ran through the dark waves of her hair twisting it into a cascading fall that revealed for the first time the soft and fragrant lobe of her ear"
You are the second blogging friend that has mentioned 'madness'. Does that mean we are all destined for it? I am beginning to wonder. I haven't had my hair that long since well, maybe never. Lisa's comment cracked me up by the way. It's a lovely pony tail. Very fetching. Cute. And you look thinner. My hair is more obnoxious than usual. And I'm getting fatter. If I obsess on my appearance, maybe I'll stop thinking about politics. I am trying to grow my hair out. I cut it all off when my mom died and immediately regretted it. 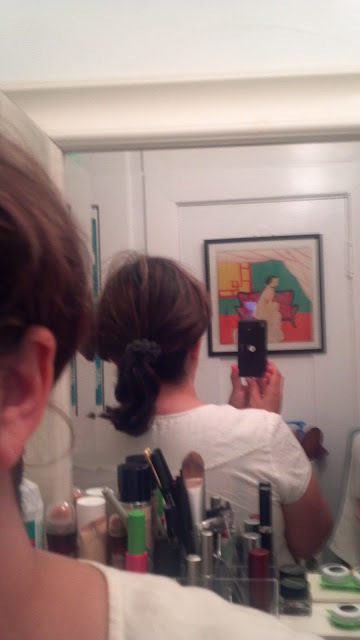 Mine has a way to go until a ponytail.